We are pleased to announce another fabulous holiday to New Zealand following an itinerary which has been developed over several years experience. We cover the most scenic and interesting parts of both the North & South Islands staying at carefully selected hotels as we go. With breakfast each morning and dinner most evenings. 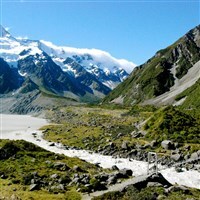 Once again we have planned the holiday in conjunction with Leisure Time Tours of New Zealand, a family firm with over 30 years experience of showing their beautiful country to overseas visitors with a personal, friendly service. Your Door to Door service will transfer you to the airport for your flight to Heathrow Airport for overnight Singapore Airlines flight to Singapore. Dinner on board. Late afternoon arrival in Singapore and then transfer to a central four-star hotel. We leave Dunedin this morning and head north along the coast to view the Moeraki Boulders - extraordinary spherical boulders are unique to this area and lie partly submerged in the sea. Next we call at Oamaru where we have time to look at the 'White Stone City'. We continue, through Sailors Cutting and then skirt the shore of Lake Pukaki to Mount Cook, New Zealand's highest mountain (12,300ft). Time will be available to enjoy an optional scenic flight over the ancient rivers of ice and the West Coast Glaciers (weather permitting). We arrive back at Heathrow early in the morning where your Door to Door service will be waiting to take you home.